I have a question that hopefully you can help me with. I am living in Dubai and I see all these beautiful Khaleeji women that wear amazing eyeliner. I can't seem to get my eyeliner like theirs. What type do they wear? Thank you for your help Alia. I love reading your blog, it has helped me so much. Thanks hon for all your lovely comments! I'm glad it's helping you. Khaleeji women are known for their eyes and especially known for the dark kohl look. One of the best products that you can use to get the dark Khaleeji eyeliner look is Shiseido The Makeup Accentuating Cream Eyeliner in Black. It comes in a small pot with a little eyeliner brush that can be used to apply it. The brush is a little harsh, that is my only complaint about the product, but it works great. 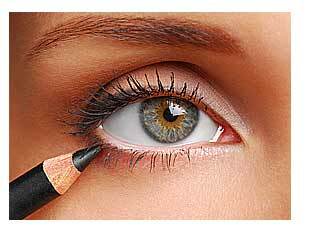 You can use your own eyeliner angled brush.The eyeliner stays on for a long time and doesn't rub off. It costs around 136 dirhams. If you can't do eyeliner in a pot and prefer pencil, then Stila Kajal Eye Liner in Onyx is defiently my choice for your waterline (inside the eye) and go with a liquid liner for the top of your eye. Two great choices that are water-proof and stay all day long is LORAC Front of the Line PRO Waterproof Eyeliner in Black or Stila Stay All Day Waterproof Liquid Eye Liner in Carbon Black. Whatever you decide to use, make sure to have fun with it! Good luck.